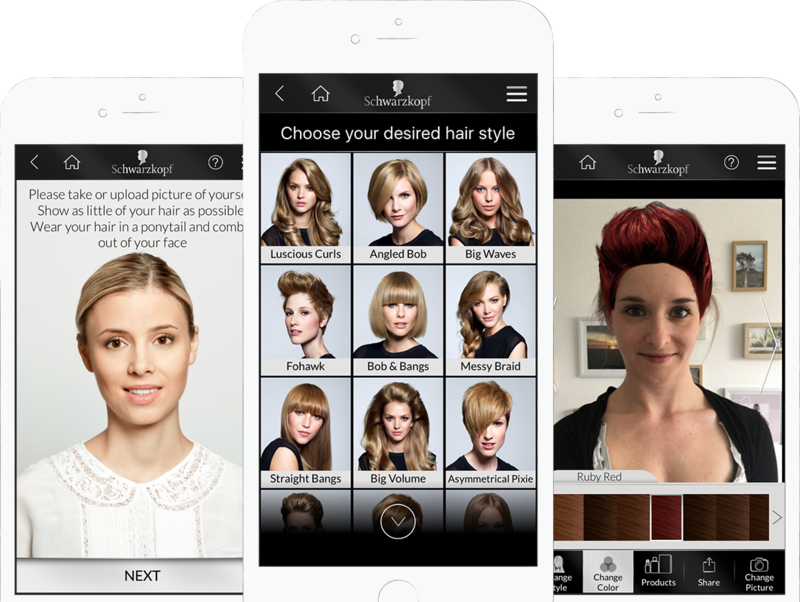 Spot on for the first 3D hair styling app the world has ever seen! 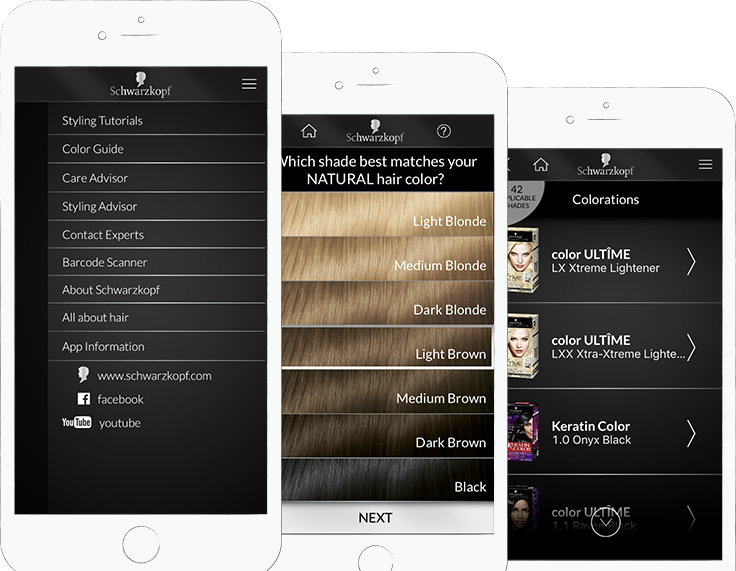 Released only in the United States in 2015, this third generation of the earlier „Color Advisor App“ grew up to an allrounder for all hair needs. Instead of just coloring their own hair, users were now able to place different 3D hair styles on any picture of themselves and to then color that hair style in any Schwarzkopf coloration existing in the USA. Furthermore, a big advice section had become part of the app. 15 stunning handmade 3D hair styles – choose yours! After having uploaded a picture of themselves, users were able to choose between 15 different hair styles to place and adjust on their picture in nearly every adjustment they needed and to then color that style in one of Schwarzkopf’s colorations. with one of the app’s styles? Each style shown in the app was really easy to make. To get a perfect result at home, all styles came with a step by step tutorial, composed of some recommendations on tools and products needed, a picture of each step and a small description what to do. Fell in love with one of the app’s styles? 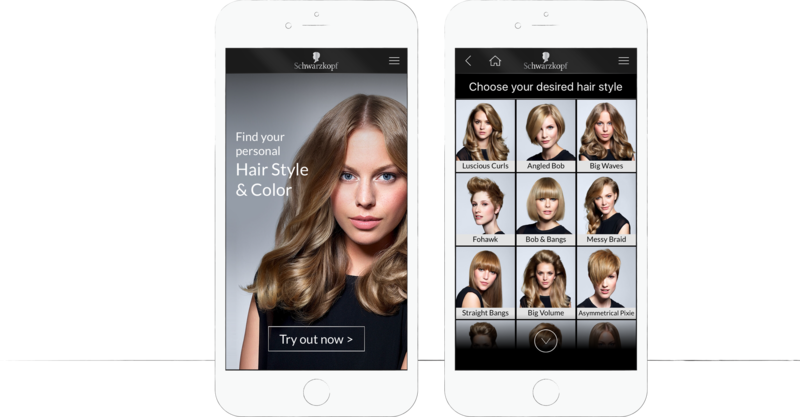 Next to the great styling and coloration features the app has been upgraded by a color guide and a care & styling advice section and was also provided with some of the features known from the older international version. Which product is the best for your hair? 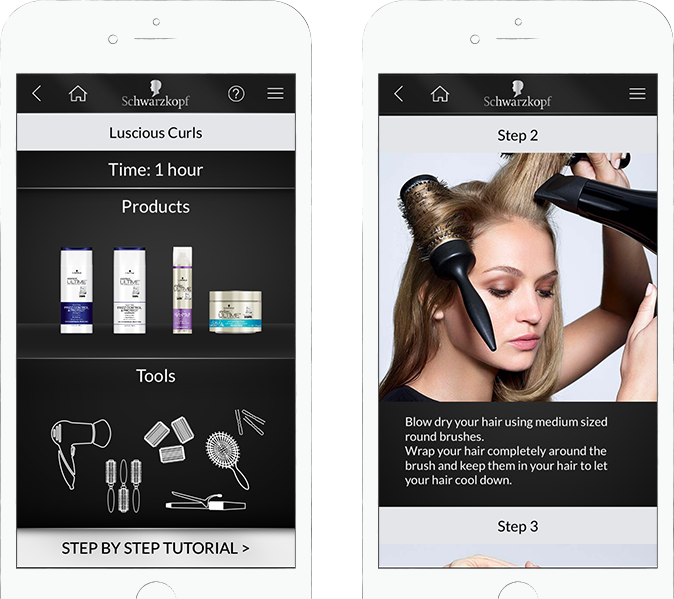 Based on some questions regarding the user’s hair, needs and wishes, the app recommended products of the range of Schwarzkopf in the USA, to help them get healthy, stunning hair. When I think back to the design and development period of this project, I remember lots of hours of retouching hair together with a colleague, a big collaboration of several designers and a very creative, challenging customer. Thus, I had found my passion for mobile app design during the design period of the previous, international version of this app, I was extremely excited to be the lead designer of this version and had great fun developing the concept and the design for the app together with the other designers. Although, it had been a little bit of chaos sometimes, managing all designers to comply with the customers wishes in a consistent way, I liked the way we mastered this big challenge and I do like the result we created.